On this Day 6 of World Breastfeeding Week a confounding ad was sent to our inbox. It was highlighting the pseudo 'benefits' of a new Abbott product - Similac for Supplementation - that is marketed specifically to women who state that they are planning to breastfeed, or are breastfeeding, their babies. Several peaceful parenting mothers have told us that when they fill out paperwork with their (U.S.) hospital to say they plan to breastfeed, they are given a "Breastfeeding Bag" from Similac instead of the ubiquitous formula bag. In this bag are samples of such things like Similac for Supplementation, along with other 'in case it doesn't work out...' items and literature. If ever there was a time to equip mothers with simple, usable, applicable facts about human lactation and their ability to produce more than enough milk for their babies, as well as how to tip the scales in favor of breastfeeding success, it would be in these early prenatal and postnatal days. The first 40 days are monumentally important for building a healthy milk supply and getting off to a good start, and anything that derails a mother in these first vital weeks can have a lasting and negative impact on her breastfeeding relationship. 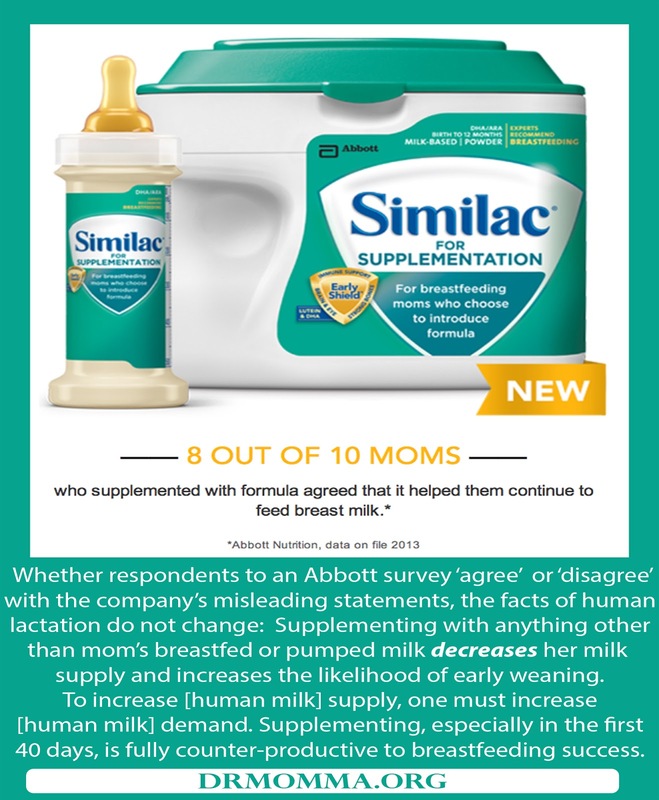 What floored us most about this particular ad is that an Abbott sponsored survey is being used as 'evidence' that supplementing with their new product will increase breastfeeding duration. Note that these surveys are typically given to an audience already connected with the company - often those using formula to begin with - or those who are still in their early breastfeeding days. Survey questions are also worded in such a way that supplementation is presented in a positive light, "Select how strongly you agree with the following statements..." "Using some formula allowed me to continue to give my baby breastmilk." Agree? Slightly Agree? Strongly Agree? Neutral? Your checked box on this survey to obtain your next free sample will go into the database to be used as support for the next product line. This is not just poorly based in science, but is an overt misleading of new mothers. Advertising that is downright deceitful. To maintain a full supply of human milk (and not much is needed in the early weeks of babyhood) a mother must drain her breasts often to create a demand. As simple and non-complex as it sounds, that is the very basic, fundamental rule of milk production: increased demand = increased supply. When you decrease the demand by supplementing (not as much milk is needed to feed baby when s/he is being filled with something else or when longer intervals pass between feeds) then supply follows suit and decreases as well. A supplementing mom quickly finds that her milk supply dwindles further, and she becomes frustrated and/or sad that breastfeeding "just isn't working out" for her and her baby. One component of milk production in mammals is termed the Feedback Inhibitor of Lactation (FIL). In Breastfeeding Management for the Clinician: Using the Evidence, Marsha Walker explains, "FIL is an active whey protein that inhibits milk secretion as alveoli become distended and milk is not removed. Its concentration increases with longer periods of milk accumulation, down regulating milk production in a chemical feedback loop." In this fashion, when products like Similac for Supplementation are used, despite their faulty marketing to mothers who desire to continue to nurse their babies, there is a negative impact on milk production and a greater likelihood of maternal anxiety over supply, followed by increased risk of early termination of breastfeeding altogether. 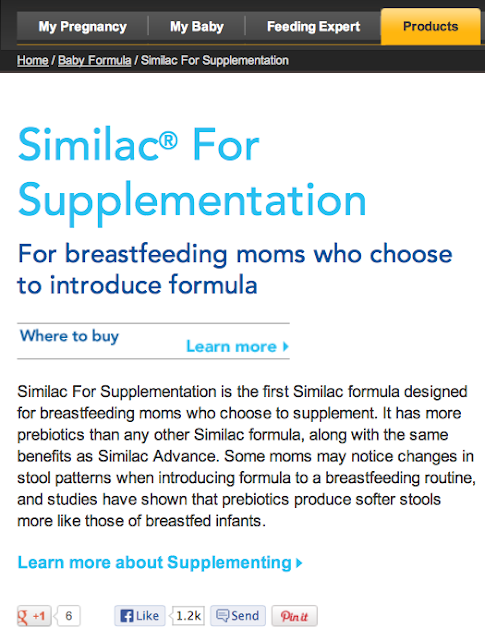 This same Similac for Supplementation ad (above) tells new mothers that their product has "more prebiotics than any other Similac formula" and that these prebiotics will have a better digestive effect (softer stools) than babies fed other formulas. The product is a far, far cry from human milk in every component of human nutrition and development - including immunology and neurology. Less constipation due to artificial feeding as the result of chemically processed prebiotics may have its benefits for those who cannot access human milk (this has yet to be determined) - but marketing a detrimental product to the mothers of babies already receiving the food made perfectly for their health and wellbeing is destructive and irresponsible. 1) Walker M: Influence of the maternal anatomy and physiology on lactation. In Breastfeeding Management for the Clinician: Using the Evidence. Sudbury, Massachusetts: Jones and Bartlett Publishers; 2006:51-82. It seems there are no lengths to which they will not stoop. Looks like we will need to extend the Nestle boycott and start boycotting Abbott too -- many thanks for keeping us informed! When I was going to through low supply (as in not enough for my baby; no matter how often he nursed he was still hungry because the milk just wasn't there) I had to supplement some and I called to ask the company that makes this what the difference is between this and the "regular" blue lid kind. They told me one ingredient and all it does is help keep their BM the same as if they were BF. I ran across your blog looking for information on supplementing with formula. Just a slightly different perspective than you put forth: I have not yet started supplementing, but will likely have to very soon. My baby is 3 months old and I've been back to work for 3 weeks. I've been pumping regularly throughout the day but some days (about once a week) my daughter eats more than I am able to pump. I've quickly gone through the small stock of breastmilk I had frozen, with only 5 bottles remaining in the freezer. Once we go through the last of what I've frozen, on the days my supply is low (seems mostly stress related), my only option will be to supplement. My only options are letting my baby go hungry, switching entirely to formula, or supplementing. So in this situation supplementing is what will enable me to continue to breastfeed.